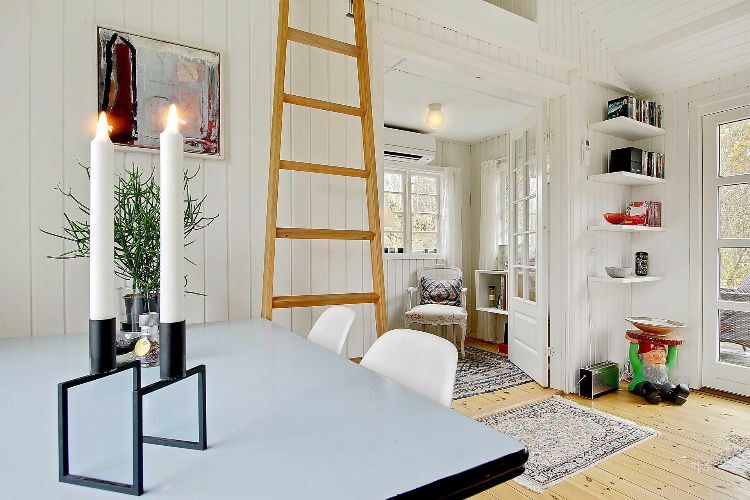 This lovely home is currently for sale in Denmark through Nybolig, a Danish brokerage chain. 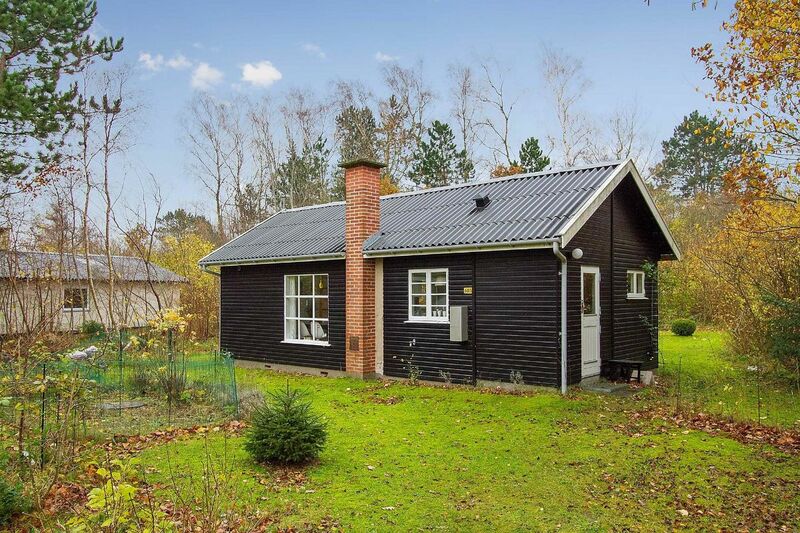 The little black cottage pops out against its lush green surroundings. The red brick fireplace contrasts nicely with the black paneling, and the old-fashioned tin roof adds even more charm. Once inside, you'll find a mostly white palette with natural wood accents. 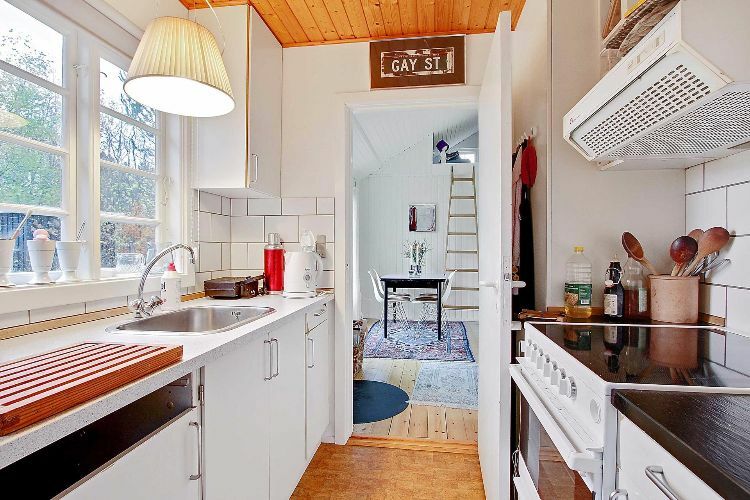 The layout consists of a main living space with a small alcove and access to the kitchen on one side. 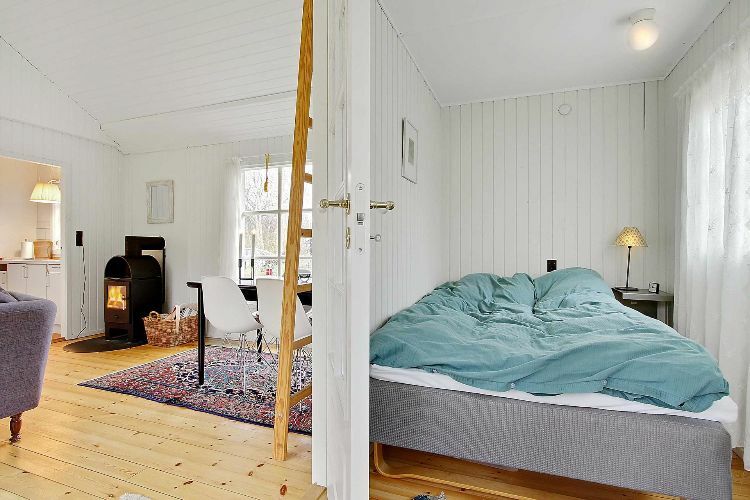 The bedroom and storage loft are located on the opposite end of the house. Bright windows and an eclectic style make this one-of-a-kind house a welcoming and comfortable home. The main space is flanked by big windows on two walls, inviting natural light and enviable views. A dining space is set up one side of the room and defined with a Persian rug. The sofa faces the floor-to-ceiling windows for viewing nature, no TV needed here. A mixture of mismatched furniture and abstract artwork create a laid back vibe. This little alcove fits a twin size bed and makes a fitting space for guests. The house seems like a peaceful place to spend an afternoon reading, bookshelves seem to be hung in every nook and cranny. 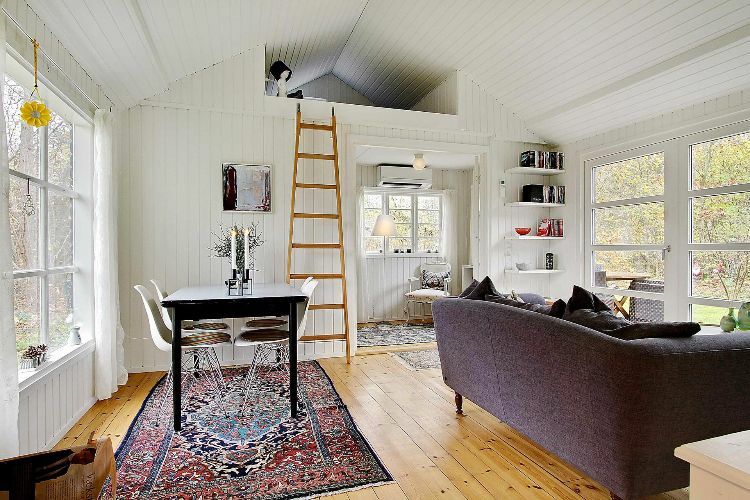 The ladder leads to a small loft that can be used for sleeping or storage. Through the double doors, you'll find a cozy bedroom. 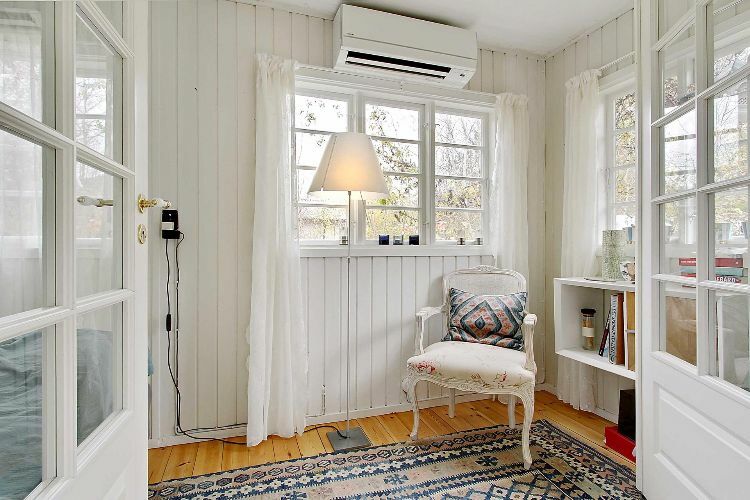 A chair and bookshelf are set up on this side of the bedroom for a simple reading nook. White breezy curtains add softness to the space. 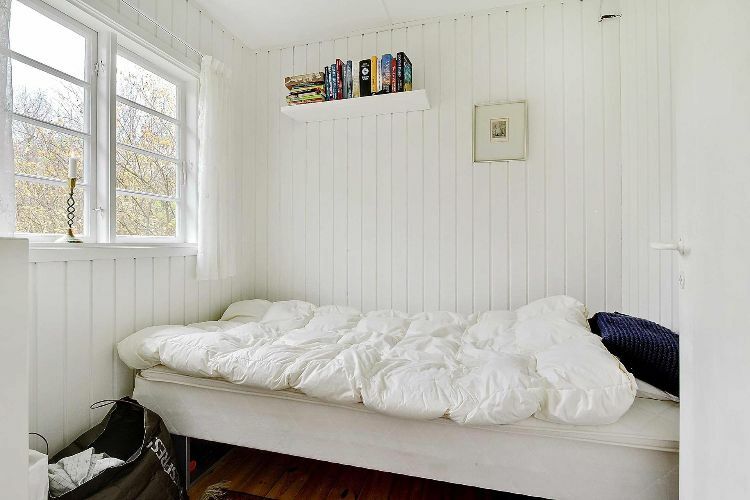 The bed is tucked into the opposite side of the room. 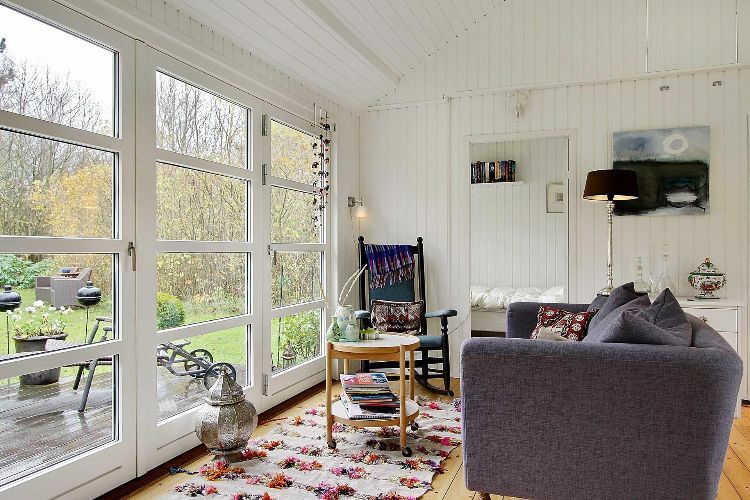 The space is simple and minimal, creating the perfect atmosphere to curl up and relax in. The galley style kitchen features white cabinets and an oversized subway tile back splash. It also boasts yet another bright and cheerful window.